Introduction: The use of different materials and techniques has been studied to decide the safest quantum of reduction of the occlusal surfaces. However, these methods provide limited information as to the actual amount of reduction with limitations in accuracy, accessibility and complexity. Objective: The objective of this study was to compare and evaluate the reliability of the most commonly used occlusal registration wax that with polyether bite registration material as a guide for occlusal reduction required during tooth preparations. Materials and Methods: For the purpose of this study, 25 abutment teeth requiring tooth preparation for fixed prosthesis were selected and tooth preparations carried out. 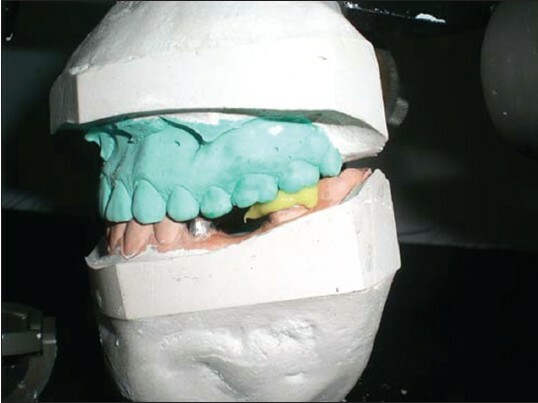 Modeling wax strips of specific dimensions were placed onto the cast of prepared tooth, which was mounted on maximum intercuspation on the articulator and the articulator was closed. The thickness of the wax registration was measured at three zones namely two functional cusps and central fossa. Similar measurements were made using the polyether bite registration material and prosthesis at the same zones. The data was tabulated and was subjected to statistical analysis using anova test and Tukey honestly significant difference test. Results: The differences in thickness between wax record and prosthesis by 0.1346 mm, whereas the difference between polyether and prosthesis was 0.02 mm with a P value of 0.042, which is statistically significant. This means that the wax record was 8.25% larger than the prosthesis while polyether was just 1.27% larger than the prosthesis. Conclusion: The clinical significance of the above analysis is that Ramitec polyether bite registration material is most suitable material when compared with commonly used modeling wax during the tooth preparation. Occlusal reduction of abutment teeth is an essential step in tooth preparation. One of the principles of tooth preparations is to conserve tooth material without compromising the occlusal morphology. The restored teeth have to articulate with opposing teeth to function harmoniously. 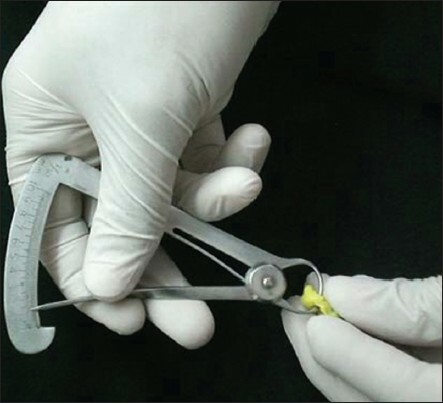 To estimate and guide during occlusal reduction, a clinical procedure are being carried out by using a material in plastic form, which sets and hardens quickly. This facilitates to estimate as well as a guide for the quantum of tooth reduction. To compare and to evaluate the reliability of the most commonly used occlusal registration wax that with polyether bite registration material as a guide for occlusal reduction required during tooth preparations. Subjects in this study were selected and consented for treatment with fixed prosthesis. It involved 11 patients with 2 posterior abutments and one patient with three posterior abutments so as to reach a total number of 25 posterior abutments. Patients where maximum intercuspation position can be reliably and repeatedly reproduced. Patients with terminal abutments involved in the prosthesis design. Metal gauge (Essago SBC German stainless). Basic principles of tooth preparations were followed in all tooth reductions. 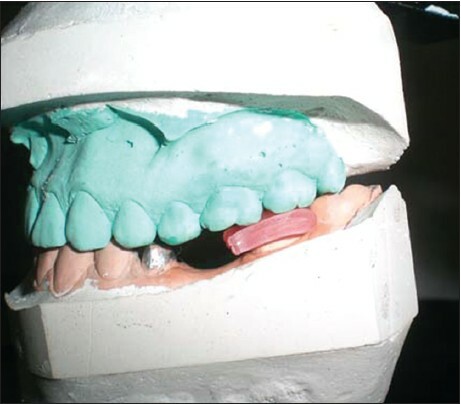 Impressions were made using polyvinyl siloxane impression material and casts poured in type IV dental stone following manufacturers' instructions. The maxillary cast was secured on a semi-adjustable articulator after recording sagittal relation and transferring it on the articulator. The mandibular cast was mounted in maximum intercuspation position with the central pin touching the incisal guide plane at zero. Modeling wax (type II) of thickness 1.5 mm was made into strips of 30 × 10 mm. Two such strips are kept over each other. Wax strips were softened uniformly in a water bath at a temperature of 45°C and were placed onto the cast of the prepared tooth mounted on the articulator. The upper member of the articulator is closed completely so that the center pin of the articulator is in touch with the incisal guide table [Figure 1]. Once the wax is hardened to the room temperature, the articulator was opened and the wax record was removed. The thickness of the wax registration was measured at three zones namely at the two functional cusps (mesial and distal) and at the central fossa, with the watx measuring gauge (Essago SBC German stainless . Such three measurements were carried out for standardization [Figure 2]. Same experiments were repeated by using the polyether occlusal registration material. 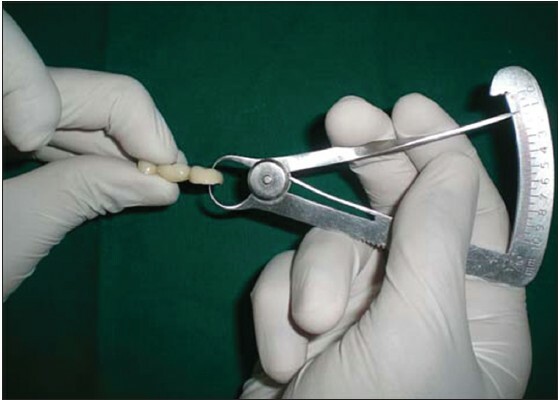 Occlcusal registration material (Ramitec, 3MESPE) was mixed according to manufacturer's instructions, loaded into a syringe and injected over the prepared teeth mounted on articulator and the articulator was closed [Figure 3]. After the material was set, it was removed and the thickness of the material at three different already selected zones were measured [Figure 4]. Conventional protocol is followed in laboratory procedures and prosthesis is obtained for cementation. The prosthesis was then seated on the cast, mounted on the articulator and the intercuspation is adjusted and checked by the central pin contact to the incisal guide table. The thickness of the prosthesis was then measured in the above mentioned three selected zones and such measurements were repeated 3 times for standardization [Figure 5]. Data thus collected were tabulated and analyzed. The statistical analysis was carried out using SPSS version 15.0 and Microsoft Excel software IBM corporation. A value of P < 0.05 was considered statistically significant. The mean difference for collective thicknesses (n = 75) between wax record and prosthesis was 0.1346 mm (P = 0.05) whereas the difference between Ramitec and prosthesis was 0.02 mm (P = 0.935) with the earlier being statistically significant (P < 0.05). Establishing a functional occlusion is a primary goal in restorative dentistry for all Prosthodontists. Premature contacts, interferences of cusps, over or under reduction in tooth preparations are the few reasons of failure of restorations. One of the objectives in all restorations is to provide sufficient material thickness. It is necessary for every operator to estimate and establish, during tooth preparation, the thickness of the selected material used for restoration. The tooth reduction and occlusal clearance being very critical, different materials and techniques have been clinically tried to take guidance to establish adequate space for the restorative material and for establishing harmonious functional occlusion. This study was undertaken with the objective of comparing the accuracy between the most commonly used material modeling wax and polyether bite registration material to be used as a guide for determining the occlusal clearance during the tooth preparation. Thickness of the wax record and polyether material were compared with the thickness of the prosthesis in two functional cusp zones and central fossa region. The results show that wax record mean value was 0.156 mm (10.5%) thicker in central fossa zone, 0.014 mm (8.49%) thicker in mesial functional cusp zone and 0.108 mm (6.73%) thicker in distal functional cusp zone; whereas Ramitec polyether registration material mean value was only 0.016 mm (1.08%) thicker in central fossa zone, 0.024 mm (1.45%) thicker in mesial functional cusp zone and 0.020 mm (1.24%) thicker in distal functional cusp zone than the finished prosthesis [Table 1] and [Table 2] and Graph 1]. From this inference can be drawn that use of Ramitec polyether registration material has better accuracy than wax registration material. However on statistical analysis, this difference in thickness between wax registration and Ramitec in individual three zones was statistically not significant. When we are discussing about the requirement of thickness of the restorative material to the range of 1.0-2.0 mm, the above percentage of discrepancy between wax and Ramitec can be very critical though the statistical test reveal they are not significant. Hence, further analysis was carried out by combining the values of all the three zones resulting in 75 samples to verify whether these discrepancies have any significance. 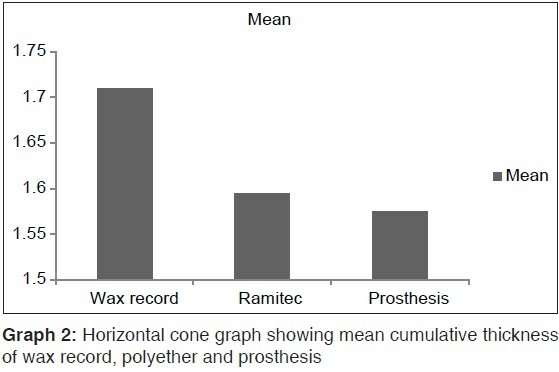 On combining the three zones and analyzing the results, the wax registration has shown to be mean 0.1347 mm (8.25%) thicker than the prosthesis whereas Ramitec polyether registration material was mean 0.020 mm (1.27%) thicker than the finished prosthesis [Table 3] and [Table 4] and Graphs 2 and 3]. 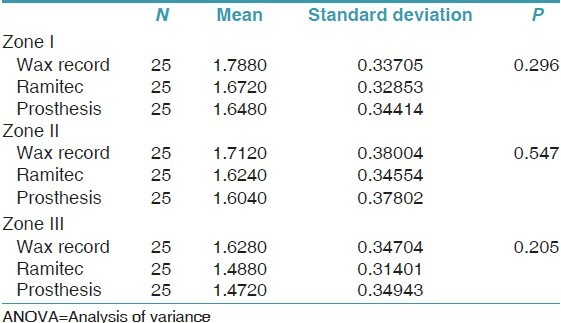 On statistical analysis of this data using anova test, a P value of 0.042 was obtained, which indicates that the difference is statistically significant (P < 0.05). When subjected to Tukey honestly significant difference test it showed that the difference of the mean value of 0.1347 mm (8.25%) between wax record and prosthesis had a P value of 0.05, which is statistically significant (P < 0.05). Moreover, the mean difference of 0.020 mm (1.27%) between Ramitec polyether registration material and prosthesis had a P value of 0.935, which is statistically not significant (P > 0.05). The Ramitec polyether bite registration material is more reliable material to be used than modeling wax to evaluate clearance requirement during the tooth preparation. Since a similar study of this kind has not been documented, future investigation is suggested on a larger sample size in order to obtain data with the use of other materials available for bite registration. Furthermore, this study was conducted on articulated casts using a semi-adjustable articulator and in centric record only. Further studies can be performed in vivo and using eccentric records as well. 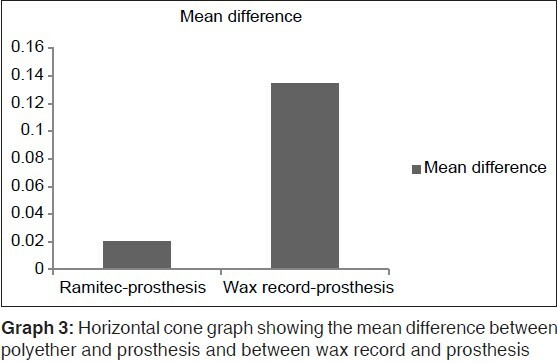 On combination of all the three zones it has shown a statistically significant difference between the thickness of the wax record and the prosthesis while the difference between the thickness of Ramitec polyether bite registration material and prosthesis was not statistically significant. Hence, an inference can be drawn that Ramitec polyether bite registration material is most suitable material when compared with commonly used modeling wax during the tooth preparation. 1. Rosenstiel SF, Land MF, Fujimoto J. Contemporary Fixed Prosthodontics. 4 th ed. Mosby; 2008. 2. Shillingburg HT, Hobo S, Whitsett LD, Jacobi R, Brackett SE. Fundamentals of Fixed Prosthodontics. 3 rd ed. Carol Stream, IL: Quintessence Publishing Co., Inc.; 1997. 3. Goodacre CJ, Campagni WV, Aquilino SA. Tooth preparations for complete crowns: An art form based on scientific principles. J Prosthet Dent 2001;85:363-76. 4. Limpinsel W. Measurement of occlusal reduction for cast restorations. J Prosthet Dent 1985;53:838-9. 5. Saravanamuttu R. A dynamic method for assessing the occlusal reduction of preparations. J Prosthet Dent 1988;59:116-7. 6. Hsu YT. Using silicone occlusal registration material as a guide for tooth preparation. J Prosthet Dent 2004;92:302. 7. Sykes LM. A simple method to ensure sufficient occlusal reduction in fixed prosthodontics. SADJ 2009;64:22-3. 8. Shillingburg HT Jr. Fundamentals of Tooth Preparations for Cast Metal and Porcelain Restorations. Quintessence Publishing Co., Inc.; 1987. 9. Craig RG, Powers JM. Restorative Dental Materials. 11 th ed. Mosby; 2002.